Exercise May Help Knees More Than Glucosamine And Chondroitin : Shots - Health News Glucosamine and chondroitin have been popular supplements for arthritis for years. But clinical trials in humans haven't shown that they're any better than sugar pills at reducing pain. Some doctors say that if placebos or supplements help people exercise and lose weight, then that's OK.
Glucosamine and chondroitin are also marketed to dog owners. But what about us humans? Unfortunately, researchers say that for us the results just don't match the glowing testimonials. It would seem to make sense that glucosamine and chondroitin could help. They're both natural substances found in cartilage, that hard connective tissue that pads joints. Glucosamine is an amino sugar that may help renew cartilage, and chondroitin sulfate is a complex carbohydrate that is thought to help cartilage retain water. Arthritis causes pain, swelling and stiffness in joints and damages cartilage over time. So the thought was maybe extra glucosamine and chondroitin could help maintain and even repair the damage. That was plausible enough for the National Institutes of Health to fund a $12.5 million randomized clinical trial to test the supplements' effectiveness. 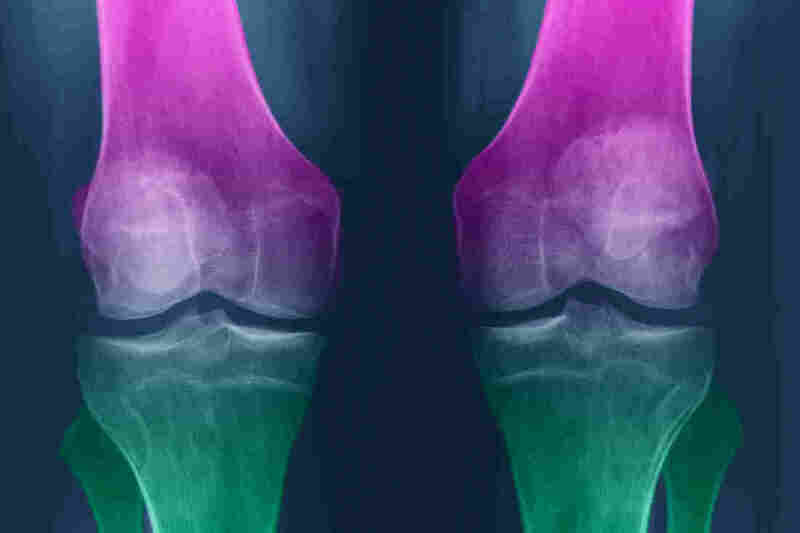 It assigned 1,583 people around the country to take either glucosamine, chondroitin, a combination of the two, an anti-inflammatory drug (celecoxib) or a placebo. Neither participants nor the researchers knew what they were taking. The vast majority of patients reported no significant difference in pain relief between glucosamine, chondroitin, a combination of the two and placebo. In all, 60 percent of patients taking the sugar pill said their pain was reduced by about 20 percent, while 66 percent of those taking the supplements reported similar pain reduction. The results were published in 2006 in the New England Journal of Medicine. But for a small subset of patients, those with moderate to severe arthritis pain in a knee, there was some benefit. "About 79 percent had a 20 percent or greater reduction in pain, compared to about 54 percent for placebo," says Dr. Allen Sawitzke, a rheumatologist at the University of Utah Hospital and Clinics and co-leader of the GAIT study. "So some patients who have severe pain may get more benefit than somebody who's got a mild case." Because the number of patients in that group was so small, Sawitzke cautions that finding is only preliminary and needs to be confirmed by further study. Two large studies currently underway, one in Europe and one in Australia, may help answer that question. They're expected to wrap up within one year, which Sawitzke says "will either reopen the debate or put an end to it, depending on the results." But the findings from the GAIT study were crystal clear, says Dr. David Felson, a rheumatologist at Boston University School of Medicine. There was just no benefit for most patients who took the supplements compared to placebo, "meaning that it didn't relieve pain any better than placebo." The supplements didn't affect structure of the joint (they did X-rays), and it didn't cause any delay in the progression of the disease compared to placebo, he adds. "It basically didn't have any effect." On the other hand, Felson says he doesn't disabuse patients of the notion that the supplements are helping if patients truly believe they are, even though a month's supply can cost $30 to $50. "Far be it from me to take away either the placebo effect or an idiosyncratic reaction that might be of benefit," he says. And if taking supplements or a placebo pill make it more likely that people will be active and lose weight, that's a good thing, according to Dr. Patience White, a rheumatologist and spokesperson for The Arthritis Foundation. "My goal as a practicing physician is to decrease pain so patients will actually do the things that really make a difference in terms of changing the natural history of osteoarthritis, which is weight reduction and physical activity," she notes. People have a hard time exercising and losing weight if they hurt. There's abundant evidence that losing weight and regular exercise are the most effective treatments available for osteoarthritis pain, White adds. "It's quite striking," she says. "If you lose only five pounds, you're talking about the equivalent of 20 pounds [less stress] across those knees, so you can imagine it would make quite a difference." Pretty much any type of exercise seems to reduce pain and increase flexibility, according to Felson. "There have been a variety of different exercise studies which have tried everything from water aerobics to walking to muscle strengthening, and they all seem to work."